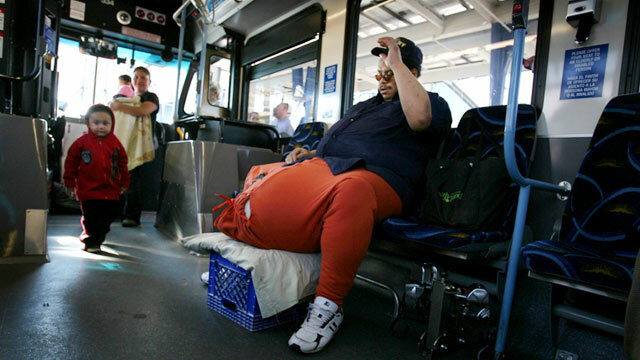 Wesley Warren, Jr. rests his scrotum on a milk crate after boarding a bus in Las Vegas, in this Oct. 4, 2011 photo. Warren has a condition called scrotal lymphedema, which has caused his scrotum to swell to over 100 pounds. "I quickly sat up on the side of the bed after bursting out of an incredible nightmare," said Warren, 48, recalling the mid-sleep maneuver that "slammed" his right testicle. "I felt the most enormous amount of pain that one could possible imagine." The pain quickly subsided, though, as if "a big rig was rolling off" his scrotum, Warren said. "I felt like I'd dodged a bullet." "I went to the ER and they treated it as though I had some kind of infection," Warren said, recalling a course of antibiotics that had no effect on the bulging mass. "I went to other doctors, and no one was able to figure out anything to for me. They'd refer me to another doctor or surgeon, but because I don't have insurance or the financial means to pay for these folks on demand, the appointment would be six weeks away or three months away." "It may not sound like the classiest of email addresses, but it's one people can remember," he said, noting that "The Howard Stern Show" was his platform of choice because of its predominantly male audience. "I had a disability that was only getting worse, not getting better." Warren, who was later photographed wearing a hoodie as pants to accommodate the growing mass and stopped "every few steps" to rest his scrotum on a milk crate, also caught the attention of a California surgeon specializing in scrotal lymphedema, an accumulation of lymphatic fluid inside the scrotum. "It's very disabling condition because the patient can't work, and if they can't work they often don't have insurance or the money to pay for care," said Dr. Joel Gelman, director of the University of California, Irvine's Center for Reconstructive Urology, who ultimately diagnosed and treated Warren for the condition. "He said he didn't have any money to pay for anything, so we did it for free." Warren used money from "The Howard Stern Show" listeners to travel from Las Vegas to Irvine, Calif., where on April 8 Gelman removed the 134-pound mass in a 13-hour surgery. "Some of the veins in the mass were a quarter-inch in diameter," Gelman said, recalling the lengthy and risky procedure to remove the mass in one giant piece. "With the fluid and other tissues, I would say the total weight he was carrying around probably exceeded 160 pounds." Warren, who is still recovering at a nursing home in Orange, Calif., said he can finally wear normal underwear and pants, but he's not yet used to the dramatic change. "My body is acclimating," he said, recalling the extraordinary effort it once took to keep his oversized scrotum from painfully swinging between his legs. "I'm still not able to get around much and enjoy driving or going to dinner. ... But I intend to make up for it and treat myself to a truly fabulous meal and enjoy relaxing for at least a few days." Warren said it doesn't feel like he's 160 pounds lighter, noting that he weighed about 500 pounds before the surgery. "I couldn't put my legs together to get on a regular scale, so I went to a newspaper and scrap metal recycling yard to use their scale," he said. "I never truly felt that was about the weight. I felt like I was walking to accommodate the awkwardness of it." Another scrotal lymphedema sufferer, 57-year-old James Ortiz, said he felt like he was walking on the moon after surgery in 2008 to remove his 80-pound mass. "I remember the first time I stood up without it," said a choked up Ortiz, who lives in San Marino, Calif. "I felt 1,000 pounds lighter and could finally put my legs together. It was amazing." Ortiz, who feels like a "small fry" compared to Warren, said he used a makeshift harness to hold up his scrotum, which felt like a 1,000 pound steel ball. He, too, was unable to work, and said the condition also contributed to his marital troubles and subsequent divorce. "At first my doctor said it was because I was overweight," said Ortiz, who currently weighs 515 pounds. "But I lost about 100 pounds, and my scrotum didn't change. In fact, it got bigger." Gelman, who also removed Ortiz's mass, said men with scrotal lymphedema are often instructed to lose weight because doctors are unaware of the condition or uncomfortable making referrals for surgery. "But the reality is, surgery is really the only effective treatment," he said. Ortiz still needs surgery to reconstruct his urethra, which was damaged by his bulging scrotum. But he stressed that the operation to remove the mass was life-changing. Warren, too, said leaving the mass untreated for much longer would have been "suicide." "One reporter wrote that I purposely turned down a free million-dollar surgery because I was enjoying the limelight," he said, alluding to an offer out of Athens, Greece, that he was unable to accept because of the travel expense and risk involved. "That I would choose fame and fortune over having the surgery, that is not true at all." Warren said he's been saving up donations and his social security checks to cover the cost of his hospital and nursing home stays as well as post-op check-ups. He said he plans to set up a charitable foundation to help subsidize his care and eventually "morph into something beyond me and my needs into something that can really, truly benefit society as a whole based on educating people." But first things first: Warren wants a decadent dinner of scampi served over fettuccini with a rack of lamb -- a departure from the mainly vegetarian meals served at the nursing home. "It's all part of the pathetic life one has to deal with trying to recuperate from such a devastating handicap," he said jokingly, after asking the nurse for another dinner roll. But he quickly returned to his serious tone. "I call Dr. Gelman my lifesaver, and I'm grateful to him and all those caring fans of 'The Howard Stern Show' that have supported me through this," he said. "I cannot express," he added, with an emotional pause. "Enough cannot be said."